The Chattanooga Board of Zoning Appeals is to meet Wednesday at 10 a.m. at the Development Resource Center on Market Street. A community group plans to offer an alternate layout for a proposed Publix shopping center off South Broad Street at a zoning meeting Wednesday. However, a spokesman for the developer said the substitute isn't workable. Jim Johnson, who heads Chattanoogans for Responsible Development, said the alternative keeps the Publix supermarket at the back of the lot at South Broad and St. Elmo Avenue. But the proposal includes a handful of one- and two-story buildings along South Broad, he said. "It's a town center-type approach," Johnson said. With a planned extension of the Riverwalk on one side of the 4-acre site, the extra buildings which could hold restaurants and other commercial space create a destination rather than just a supermarket, he said. "It's a place where you come and do more than just shopping," Johnson said. The Chattanooga Board of Zoning Appeals is slated to meet at 10 a.m. Wednesday at the Development Resource Center on Market Street to hear a request for variances which would enable an Atlanta developer to build the Publix at the site. Under the developer's plan, the 32,000-square-foot store would go at the rear of the lot with two standalone buildings close to the intersection of South Broad and West 35th Street. Mike Price of MAP Engineers, representing the developer, said the standalone buildings are designed with quite a bit of glass and to sit close to the street "to create an inviting atmosphere" with a plaza area. He said the developer's plan looks at the needs of today. "What do we need to be a successful store today?" Price asked. "For the store to work today, what we've show is what's needed." He said if the developer is awarded the variances under Urban General Commercial zoning, there's nothing to prevent more buildings to go up along the road at a later time should economic and social changes occur, such as the use of fewer cars by shoppers in the area. "We'll adapt and go from there," Price said. Johnson, however, said the group's proposed layout meets "the spirit and the letter of the law" regarding the new urban commercial zone. He said the shopping center will set the pace and tone for the rest of the South Broad corridor traveling from St. Elmo toward downtown. 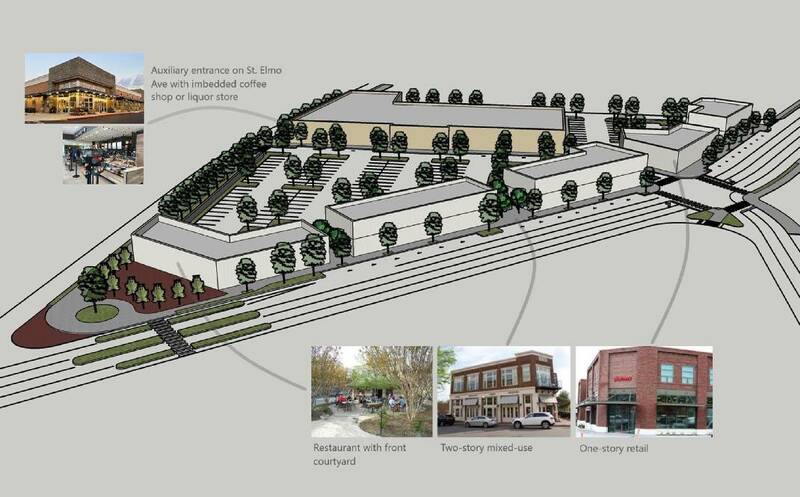 "It will create a welcoming gateway to the city as opposed to 'here's a supermarket and a parking lot,'" Johnson said. He said the alternate would produce more tax revenue for the city. "The lowest-level property value ... is a parking lot," Johnson said. "Once you start putting buildings on it — two-story, mixed-use — there's a much higher property value." Also, he said, the greater concentration of commercial space would create more jobs, calm traffic along South Broad and create opportunities for walking, biking or public transit. In July, the proposed store cleared a key hurdle as members of the Chattanooga-Hamilton County Regional Planning Commission approved a zoning variance for the project. » Front setback from the primary street (Broad Street) to be increased from some 15 feet to about 64 feet for the main building. » Parking between the building and primary street. » The percentage of doors and windows on the primary street facade of the main building to be reduced from the required 30 percent to a minimum of about 7.8 percent. Price said that if the proposed project receives approval from the board, it will need a land disturbance permit. Construction likely could begin in the spring 2019, he said.